A comic thriller that makes you laugh, but ends up killing the thrills, says Prasanna D Zore. 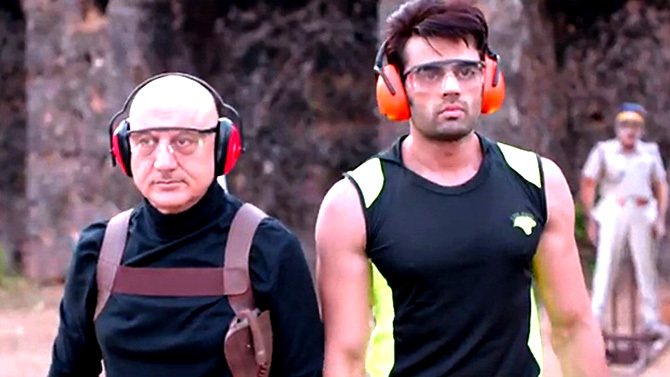 Contract killers Charudutt 'Dattu' Sharma (Anupam Kher) and his son Baba (Manish Paul) are brainstorming over a conspiracy hatched by a wily politician. The politician's go-to man, a cartoon of a 'fixer' (Aakash Dabhade) levitates midair, hauled up by ropes by the father-son duo to extract details of the plot. The duo brandish their guns, so you know they are 'contract' killers. And these are not just any contract killers; in their veins runs contract killing and a bloody lineage to be proud of. The 'fixer' blabbers in Konkani, so voila! you know Baa Baa Black Sheep is set in Goa. And since it is set in Goa, how can you not make drug deals a part of the plot? But Goa is famous for its beaches and beautiful women, and so you have Angelina (Manjari Fadnis), who is madly in love with Baba. Then comes the 'thrilling' twist in the tale. Angelina's father Brian 'Santa Claus' Morris (Anu Kapoor) is a con artist who sells copies of original paintings to gangsters and politicians. During one such deal, he gets into the crosshairs of wily politician Utpal Shivalkar (Manish Wadhwa) and his business cohort Daniel (Vineet Sharma). The politician, to add to your 'thrills', is blackmailed by an art gallery owner Kamya (Natasha Suri). As a trade off, she wants an original painting which Santa promises to deliver, but as is his wont, delivers a fake and scoots. The politician's life is in a mess and so he threatens Daniel to either bump off Santa or get him the painting. Daniel, through this 'fixer', hires the father-son duo and that, sort of, completes the circle. One more character orbits outside this circle and so he ramrods his way in. Meet ACP Shivraj Naik (Kay Kay Menon) who plays up every character in Baa Baa Black Sheep so that not only does he make money but he also cleans up the system. With so many characters playing their parts in just over two hours, Director Vishwas Paandya gets his comic timing right, but loses out on the plot and the thrills. Anupam Kher -- as the contract killer who transforms into a Singham clone from an uncle type while on the killing job -- and Annu Kapoor as the con artist who swindles people with his charm and fakes, are a delight. Maniesh Paul is good as well. Kay Kay may be a fine actor, but he looks completely lost here. Paandya deserves some credit for making his first film entertaining enough. It's a pity he misses out on the thrills.